Audiomachine is proud to present Drumscores 2. 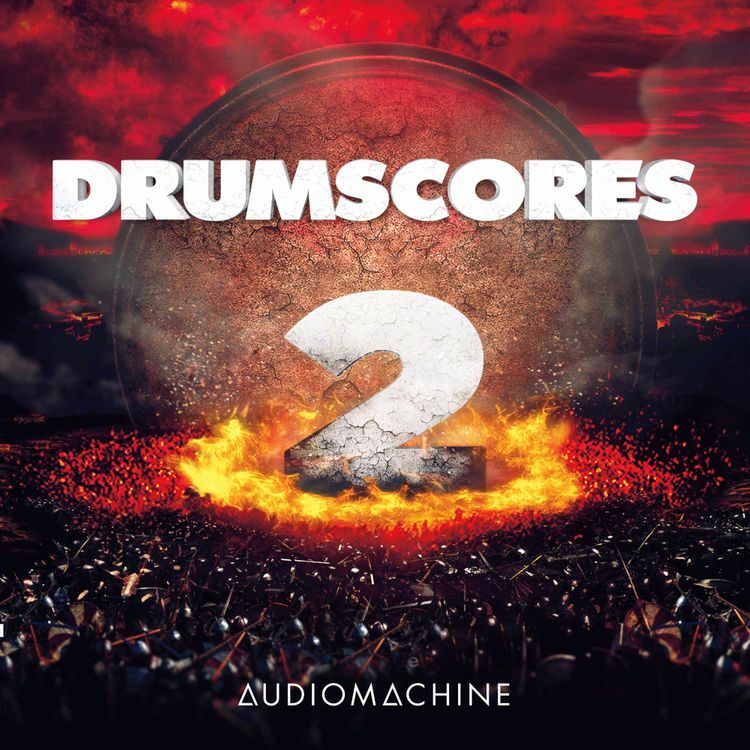 By fusing live, organic percussion with mind-melting sound design, driving synths and tonal elements, Drumscores 2 explores unique rhythms and visceral textures. The result is thunderous, bombastic, intensely raw and utterly explosive. Deep, organic taikos pound a war-like march, while dark bass pulses accent the beat, building with dark tension, mysterious tribal rhythms layer in, rising in intensity. A deep space drone with pings and low booms layer with a pulsing synth, punctuated by explosive hits and an urgent alarm, building with scattered percussion, grinding together with intensity, rapidfire hits swell as the light of each star burns out. Ominous drone and pinging intro with massive taiko clusters; sub bass pulse and shrill, pulsing synth alarm build tension and intensity; swaggering rhythmic build with gritty guitar intensity leads to huge, exciting climax. Tense, anticipatory taiko cluster hits and piercing, swirling pad intro swell up to huge, driving middle with pulsing bass synths and relentless percussion. A freight train of power and intensity. Startling, distorted piano strikes, uncomfortable string rise and rhythmic build make for a very dark and dangerous intro; building with synths and textured FX, driving relentlessly toward an intense climax. Something's knocking and it's about to break down the door. Pounding taikos and dark, grinding synths wind and pummel their way through a futuristic spy tech investigation montage. Tense and anticipatory, pounding intro with suspenseful pads build in intensity to an aggressive assault with distorted, squealing bass, pulsing, driving synths and a high alarm. Time is up and there will be no survivors. Sub bass beats and textured, pulsating drones layer with ominous percussion clusters in a steady, menacing tempo. Futuristic, ticking synths swirl in, swelling to a rhythmic and dangerous climax. Huge drum hits and bass drops create a suspenseful intro, futuristic, glitchy synth textures pulse and rise, screeching strings build tension up to a driving, tech investigation spy synth middle, building to a huge, rhythmic, swaggering back end. Huge, cavernous taiko clusters and low droning pad lead to squealing, grimy synth textures and a massive power down; intense, driving percussive middle sets up an exciting, futuristic back end. Deep, organic taiko clusters and mysterious pads create an ominous intro, building with tribal frenzy to a warlike, intense middle, skittering FX textures rise eerily while shrill synths call an intensely alarming back end. Huge, shrill blasts and pounding taikos rampage with squealing synths, charging towards an intense, exciting spy/tech action back end with swaggering, tough-as-nails outro. Suit up, soldier. Bombastic, militaristic taikos signal a call for battle; chopper-like fluttering, distorted synth blasts and tweaked alarms. Skittering FX and deep bass pulses layer on urgency and tension while the cue builds to a massive climax. Dark percussion and menacing FX build, ticking and pounding into the scene. Futuristic synths drive the action while rolling snares and drums churn and swell. Cymbals crash, distorted bass blasts, rising to a huge, pulse pounding, darkly heroic back end. Huge, growling, distorted hits, twisted textures and FX stabs lead to aggressive, stuttering clusters like automatic weapons fire, squealing synths and bombastic drums slam to an insanely intense outro. Powerful taiko clusters blast over skittish synth textures and low droning pads. Metallic percussion ticks while a thick, distorted bassline churns underneath, accented by heavy guitar blasts, building and rising like machinery to an intense climax. Huge taiko clusters with ominous synth pads and guitar pings create a tense intro. Swelling up to a battle-ready beat with squealing guitar accents and heavily distorted bass synths. Swaggering rhythms and textures build to a massive, heroic climax. Rapidfire pinging and percussion set off a wild driving rhythm, tense, relentless and exciting, a massive rise builds up the chase to the back end. Serious taikos pound a dark march while distorted synths flange and scan the post-apocalyptic wasteland. Brutal, rapid-fire percussion and explosive, buzzing alarm blasts rain down destruction on the resistance fighters. One last battle before defeat. Live, organic and tribal, like a ritualistic dance, building rhythmically, relentlessly pounding with raw intensity.